Working with the RHS at Regent’s Park last Thursday, it was clear that spring was now upon us. I was greeted with an oasis of yellow trumpets all heralding in the new season! And when I arrived at the plot this weekend, there were two things I was immediately delighted to see: 1) The polytunnel was still standing, and 2) the daffodil bulbs I planted last autumn were now rewarding me with their beauty. Being the old romantic that I am (that’s right folks, inside this withered and battered old gardener beats a young, foolish heart), I saw the opportunity to cut several blooms and present them to Soph. With the windowsill episode firmly behind us, this was a chance to earn myself some brownie points… and boy did they work! That very evening, the love of my life (not now, Monty) took me out to dinner. But we’re getting a little off topic with talk of springtime ardour. Flowers look wonderful in their natural state, growing happily in borders, woodland or on your allotment. 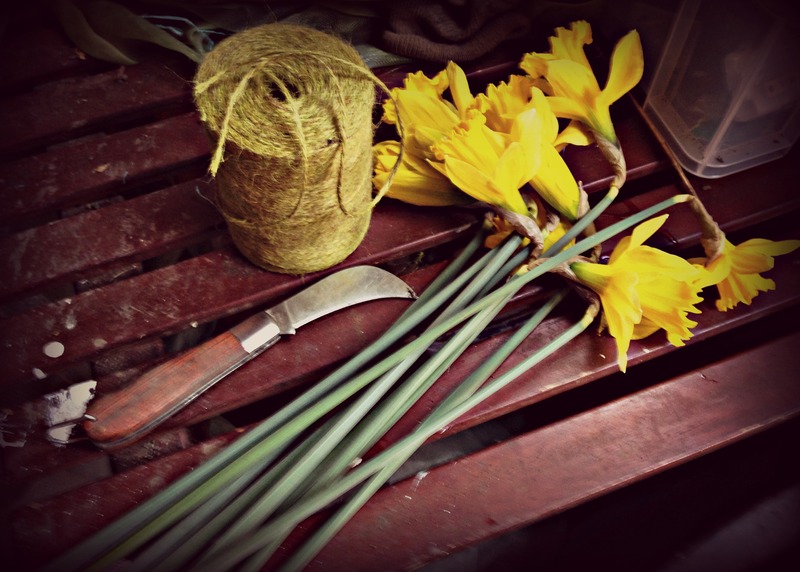 However, with so many daffodils bursting through, I’m sure Mother Nature didn’t mind me cutting several to take home with the excuse of romance. Flowers cut, I was all too aware that the jobs on the plot are growing week by week. After a freshly made coffee from the stove in my shed and another cheeky treat from the local baker, the daffodils gave me inspiration to do something rash: create a new flower bed. Not only for extra colour and to coax in the wildlife, but those bursting buds could cover up a makeshift windbreaker I erected several weeks ago out of corrugated iron, as although it’s doing it’s job, it’s not the prettiest of things. Excited by this ‘Eureka’ moment, I made haste and sacrificed one of my bedding paths that runs adjacent to the windbreaker. Removing the weeds, turning the soil and adding some well rotted organic matter, I got things going and planted thirty plus gladioli bulbs with a little top dressing to finish off. This should do wonders for the late summer season, but I need to think about what to plant for spring and early summer… hmmm, I’ll let you know on that. 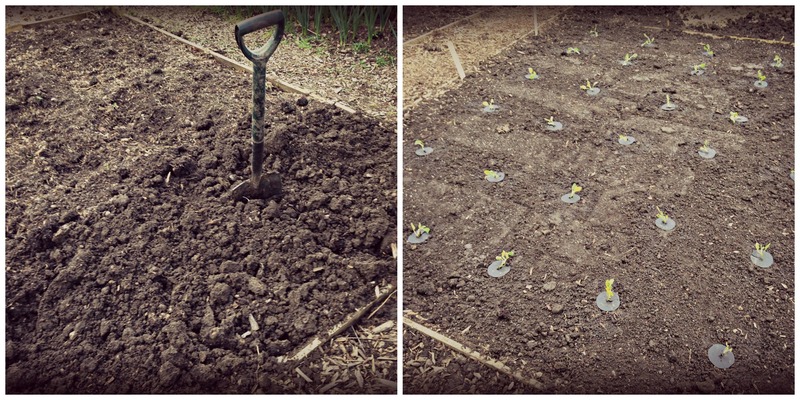 Moving on, I turned to the main job: planting my early brassicas – broccoli, cabbage and cauliflower. They’re the first thing I’ve planted on the plot this year, and it was a long time coming. I removed the weeds, carried out secondary cultivation and consolidation, added some fertiliser and began planting. A fresh bed is always pleasing to the eye, but seeing all my early brassicas out on parade wearing their brassica collars and standing to attention filled me with great pride! However, the final lashings of winter aren’t quite done and I’m expecting a few more cold spells, and although brassicas are hardy, they’re always grateful for that extra protection. As I sit and write my weekend instalment on Plot 23d, there’s a bed full of brassicas tucking down for the night under the cover of their fleecy cloches. Agents of Field are off and running, let the 2015 growing adventure commence!! I just loved that description. That is just how I feel when I see the daffodils bloom. What kind of stove have you got at the allotment? I’m green with envy at your daffodils. Apart from some older bulbs, mine are still just about peeping through the ground…. It’s a camping stove and whistle kettle I bought last year, and so far it’s doing me proud. Hot drinks on the plot have helped get through the winter as I’ve been creating a new allotment, beds and paths. 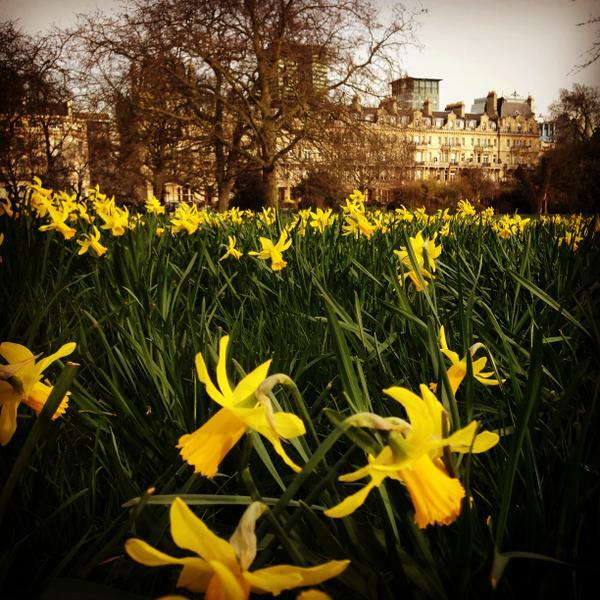 We’ve had some sun this week so hopefully those daffodils of yours are starting to shine. Anyway, your camping stove was obviously a worthwhile investment! Congratulations on your award (which you totally deserve by the way – the name of your blog alone makes you a worthy winner!) and thank you so much for nominating us. As you said, we probably exceed the maximum number of followers to be eligible for this award, but we’re really chuffed you thought of us. Thank you.